Dulce de leche is an amazing milk-based caramel sauce that is very popular in Latin and South American countries, though it is found in many different countries throughout the world. It is very sweet and very rich, with a distinct flavor of caramelized milk that really sets it apart from other caramel sauces. It’s delicious and it’s addictive. 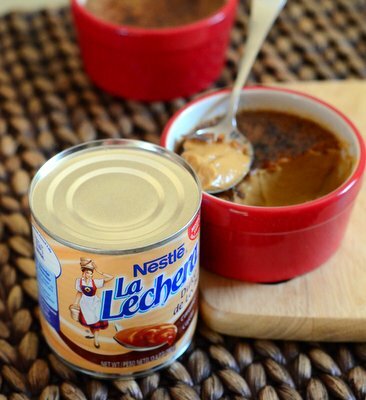 It can be tempting to eat it straight out of the can or jar that it came in, but it is also wonderful to work with in the kitchen and I frequently use it in other desserts, from Dulce de Leche Brownies to these Dulce de Leche Creme BrÃ»lÃ©es. The dulce de leche is the main sweetening and flavoring element in this custard recipe. It is combined with heavy cream, milk and eggs, as well as both vanilla and almond extracts, to create the base of the custard. I primarily used egg yolks, which makes for a very silky and rich finished custard – one that you would never know was so easy to make. 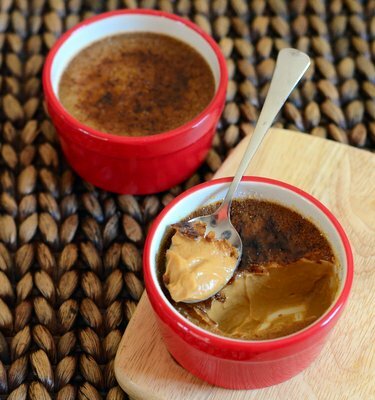 The base is divided into small ramekins and baked in a water bath, then cooled and refrigerated before being topped with sugar and brÃ»lÃ©ed. The custard itself is almost unbelievably good. The flavor of the dulce de leche really carries through to the finished product, its sweetness tempered slightly by the milk and cream that are also used. The burnt sugar layer on top brings out those dark caramel notes from the dulce de leche even more – and creates a nice textural contrast from the custard beneath it. You’ll need a kitchen torch to caramelize the sugar, but you could stick the custards under the broiler quickly if you don’t have one. That said, the custards are extremely good even without that burnt sugar topping, and you may find that you’ve eaten one or two portions before getting to that point! I used store-bought dulce de leche for this recipe, since it is widely available in my area. If you can’t find it at your local market, a specialty store or a Mexican market is a great place to look, and if you’re feeling ambitious, you can always make your own dulce de leche and use that as a base, as well. In a large bowl, whisk together egg, egg yolks and dulce de leche until well combined. Whisk in the heavy cream, milk, salt, vanilla and almond extracts until everything is very smooth. 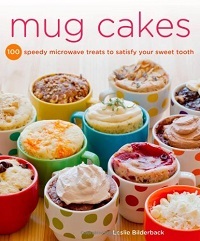 Strain into a large measuring cup or bowl with a pouring spout. Divide evenly into 8 six-ounce ramekins. Place ramekins in a 9×13-inch baking dish or another large, rimmed dish. Fill with hot water until it reaches 2/3 of the way up the sides of the ramekins. Bake for 30-40 minutes, until custards are just set and jiggle slightly when the pan is moved. Allow to cool in the water bath, then refrigerate for at least 4 hours (or overnight). Before serving. Sprinkle each with 1-2 tbsp sugar and brulee with a hand torch or a few seconds under the broiler. Serve immediately after caramelizing the sugar.